We can connect this type of projector to any computer; it could be a laptop or desktop, Mac or PC. You can see any image or document on your computer on the big screen. Let us know the type of computer you are going to use (PC or Mac), and ACD will bring the correct cables and accessories for one or the other. What you need to know is that after your computer is connected to the projector, and you can show anything you want. Anything you see on the screen of you laptop will be projected on the big screen. We recommend you limit the use of small fonts in your presentations, although our projectors are very good quality and resolution, it still may be difficult for some of your guests, especially the ones furthest from the screen, to be able to read the content. Try to limit paragraphs in your presentations. It will be easier for people to read and understand. If it is necessary to include a spread sheet in your presentation with account numbers or statistics with small characters in one image, we recommend for you to create several larger or zoomed in sheets highlighting the different section so they are more visible to your guests to ensure your guests feel comfortable to read or take notes. We suggest you do not print the presentation, as most of the attendees will not take it with them. You could ask for all of the attendees to provide you with an email, so you can email them presentation and they could print if they find it necessary. 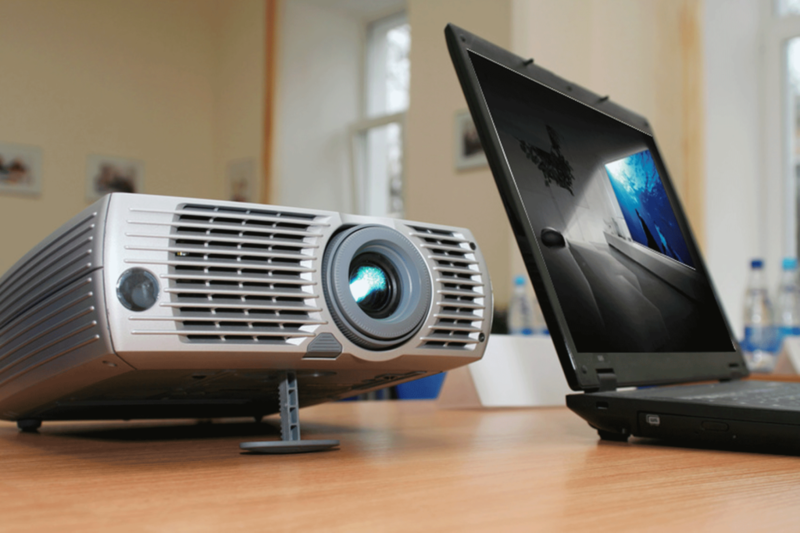 You can project any slide presentation, PowerPoint, Video or Movie, Website, image or information that is displayed on your regular laptop or computer screen with one of our special computer projectors. We will have a custom installation, provide cables, connectors, adapters, power extensions, etc. and guarantee your complete satisfaction. Just dial one of our phone number in Miami or Broward and we will take care of your rental needs. Your call will be answered by an experienced and friendly technic that will guide you through choosing the best equipment for your budget and need. We will then, provide the best projector for the location size, number of assistants, brightness in the room and the appropriate size for the projection screen.